TUCSON, Ariz. - The Pittsburgh synagogue attack reinforces a sad sign of the times. That attack and many others have religious organizations preparing their places of love and peace for the day hate and violence breaks in. Pittsburgh shows how places meant to peaceful places away from a troubled world can become special targets of violence and hate. As danger's grown, religious organizations have grown their defenses. Security was such a priority when the Jewish Federation built its new offices just a year ago that you cannot get in the front door unless the receptionist buzzes you in. Then you have to wait for that door to close behind you and the receptionist gets a chance to make sure you are not a threat before the inner door opens. Federation President Stuart Mellan says, “I think our community has adjusted to our reality." 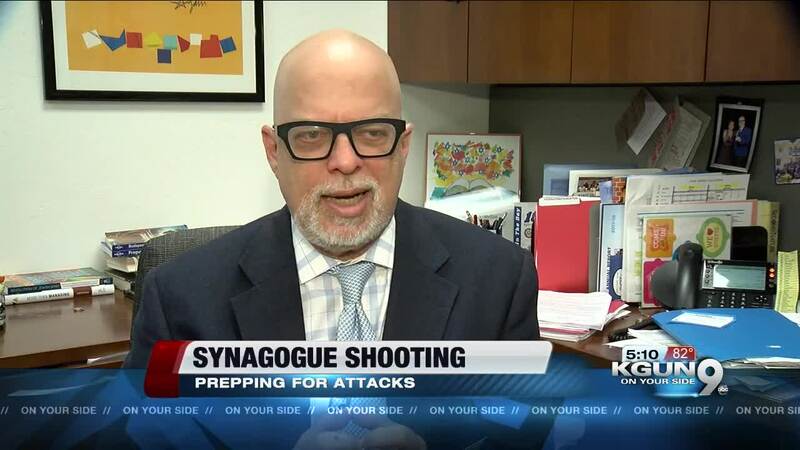 Mellan says members of the Jewish Community are quick to alert each other to any threat while they maintain an atmosphere that's welcoming----but alert. So at Pantano Christian Church they built a security team 12 to 15 years ago. It includes off duty Sheriff's Deputies and some members with concealed firearms. Pastor Blumenthal says, “We have cameras on campus, we are always looking we have people out watching who's coming in. We check backpacks we check and are looking for certain suspicious behavior." More and more religious groups are getting active shooter training to learn to recognize and head off threats, fight back against an intruder and give first aid to keep victims alive until help can arrive. First responders in a group called ICSAVE offer free training to anyone who requests it and requests go up when there's a high profile attack.